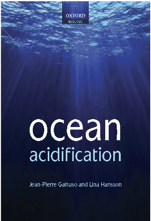 Ocean acidification is rapidly changing the carbonate system of the world oceans. Past mass extinction events have been linked to ocean acidification, and the current rate of change in seawater chemistry is unprecedented. Evidence suggests that these changes will have significant consequences for marine taxa, particularly those that build skeletons, shells, and tests of biogenic calcium carbonate. Potential changes in species distributions and abundances could propagate through multiple trophic levels of marine food webs, though research into the long-term ecosystem impacts of ocean acidification is in its infancy. This review attempts to provide a general synthesis of known and/or hypothesized biological and ecosystem responses to increasing ocean acidification. Marine taxa covered in this review include tropical reef-building corals, cold-water corals, crustose coralline algae, Halimeda, benthic mollusks, echinoderms, coccolithophores, foraminifera, pteropods, seagrasses, jellyfishes, and fishes. The risk of irreversible ecosystem changes due to ocean acidification should enlighten the ongoing CO2 emissions debate and make it clear that the human dependence on fossil fuels must end quickly. Political will and significant large-scale investment in clean-energy technologies are essential if we are to avoid the most damaging effects of human-induced climate change, including ocean acidification. Guinotte J. & Fabry, V. J., 2008. 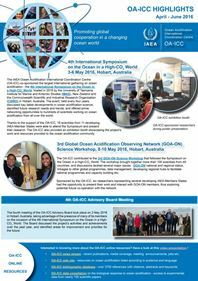 Ocean acidification and its potential effects on marine ecosystems. Annals of the New York Academy of Sciences 1134: 320-342. Article.